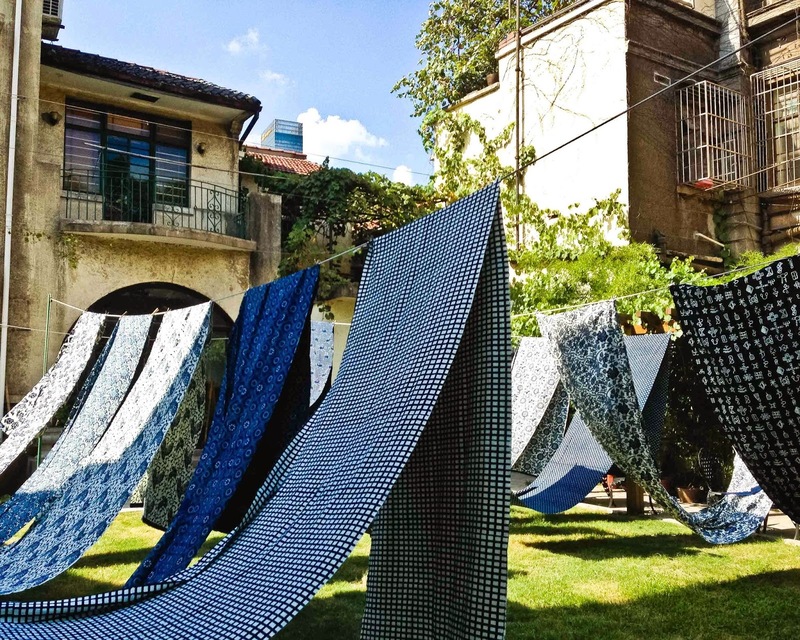 Behind a yellow lane house on Changle Lu is a garden filled with swathes of printed indigo cloth drying gently in the breeze. 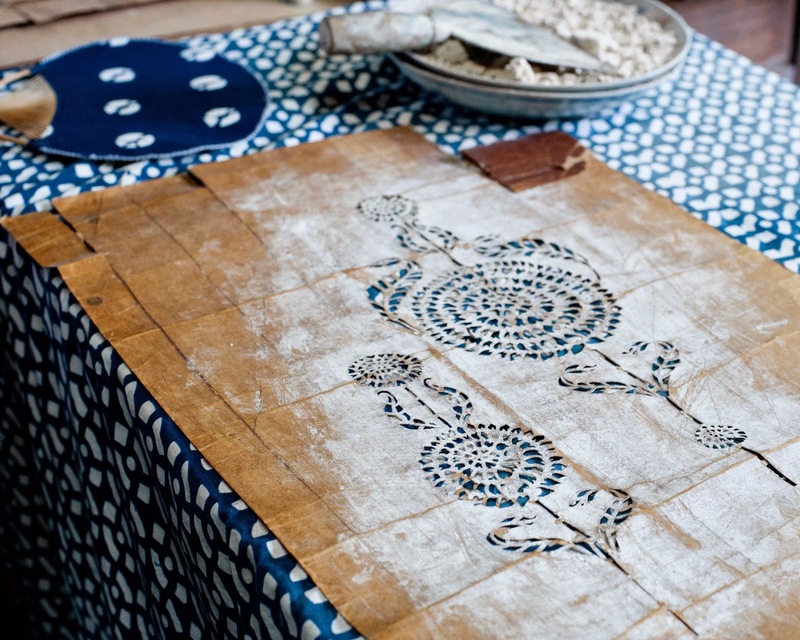 The house is home to the Shanghai Blue Nankeen Museum, originally just one small dark room dedicated to this traditional indigo nankeen fabric that has its roots in Shanghai. A chance visit five years ago to that little museum, where a man with blue-stained hands washed the dyed cloth in large laundry tubs outside in the lane, set me on a long path towards finding the methods behind the making, and the history behind the designs of this wonderful traditional fabric. 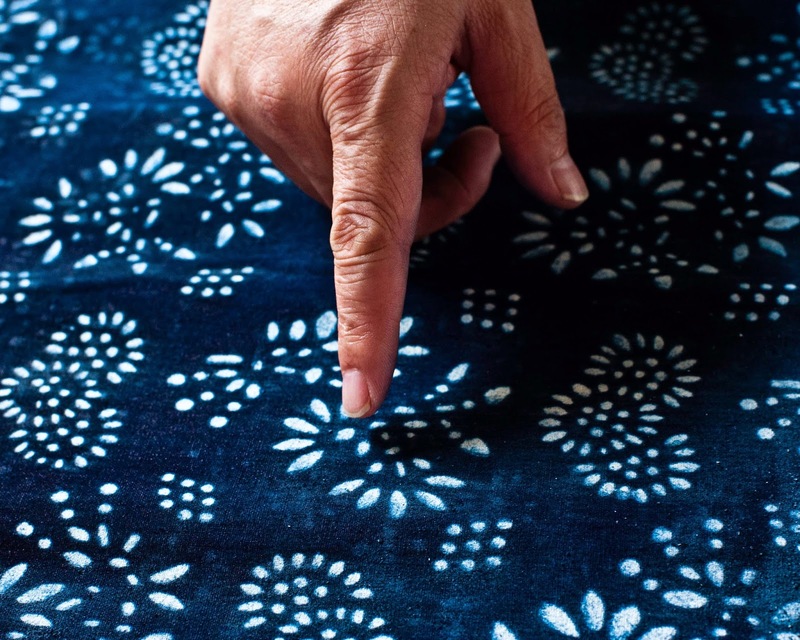 The Chinese name for blue nankeen is lan yin hua bu – blue-printed flower cloth, a more poetic name that ties nankeen firmly to its flower-based designs. Other prints are simple and geometric, and despite being centuries old they look surprisingly modern. Some near-forgotten designs have colourful stories attached. Chinese people are fearful of the ‘five evils‘ or ‘wu du 无毒’– five poisonous creatures - the scorpion, snake, centipede, lizard, and the toad. When a woman was pregnant it would be traditional to give her a length of nankeen cloth printed with these five animals as a way of providing protection for the new baby. Similarly, many Chinese people hanker after a dragon baby, a baby born in the Year of the Dragon for its strength, wisdom, prosperity and courage. At the time of marriage the newlyweds would be given dragon-printed nankeen as a way of wishing they would have a baby born on the dragon’s back. 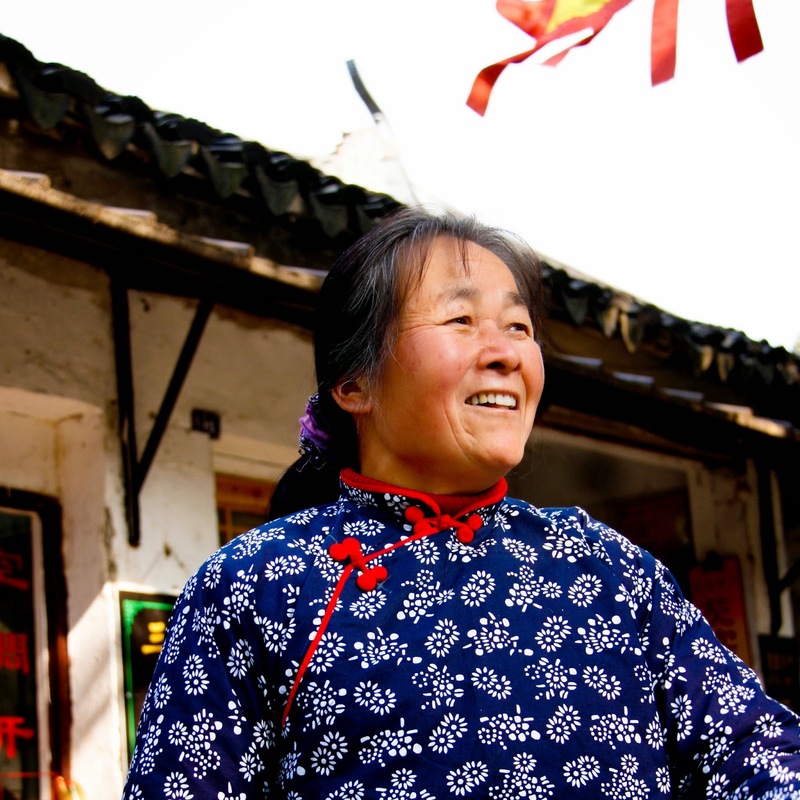 Unfortunately, as often occurs with traditional crafts, many Chinese people see nankeen as old-fashioned, worn by peasant women. 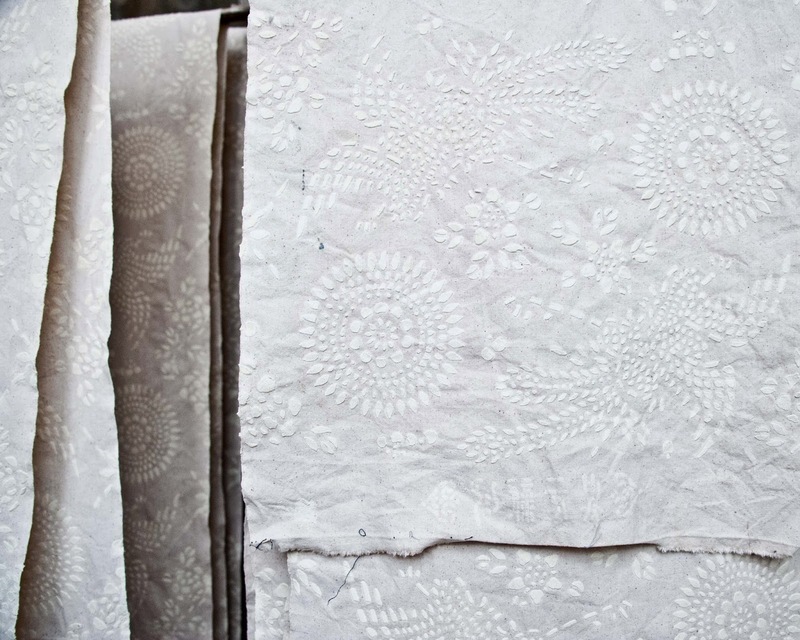 They find it hard to accept its innate, simple blue and white beauty, and the tradition of giving lengths of fabric as wedding or baby gifts no longer exists. This may change though, as blue nankeen made by hand has been elevated to the status of 'Intangible Cultural Heritage' meaning there are concerted efforts to preserve the techniques and history of its production. 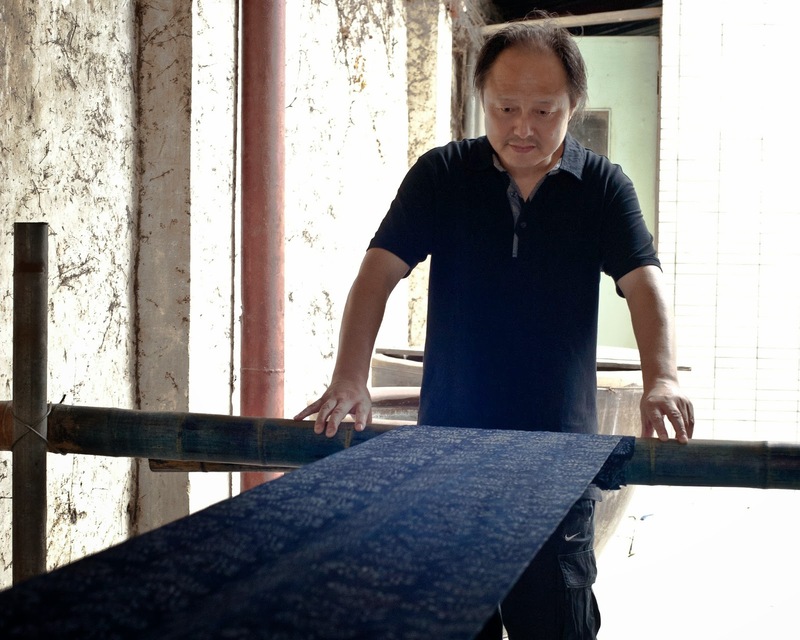 Last year in Nantong, several hours north of Shanghai in Jiangsu Province, I met Wu Yuanxin 吴元新, China’s most passionate and well-recognised proponent of the art of blue nankeen, a man who has devoted his life to its preservation and is keen to see it move forward into the future. Descended from five generation of of weaving and dyeing artisans he started studying the techniques of nankeen design and printing after a brief and unhappy stint in the Chinese military, for which he was - he says - eminently unsuited. 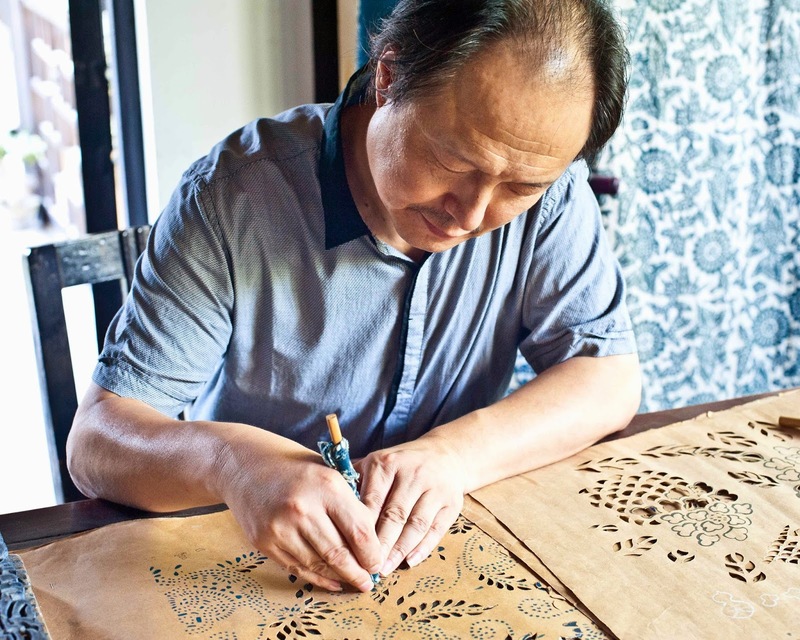 In 1997 he opened the Nantong Blue Nankeen Museum and has been honoured by the Chinese Government as a kind of living cultural relic, a Master of Art and a National Craft Master. “I feel lucky to make a living as an artist” Teacher Wu (as he is respectfully called by all who know him), told me. "Becoming a National Craft Master means a great deal, because now I know the unique art and techniques of nankeen will be passed from generation to generation." He teaches young design students at university, some of whom complete internships with him, and has been a guest lecturer at many overseas universities. 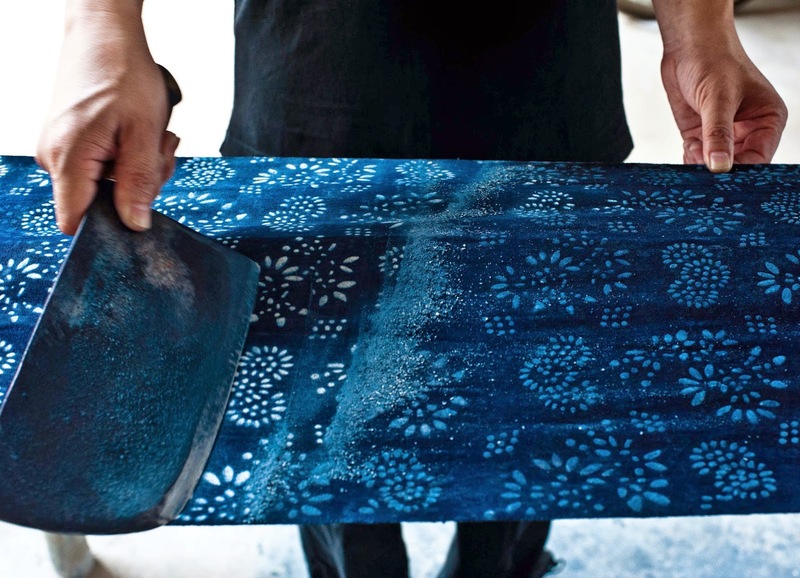 The traditional techniques he teaches are complex and take years to learn fully, with nuances of temperature, humidity and season contributing to the success or failure of the printing and dyeing process. I asked about bringing nankeen into the modern age, and whether traditional designs were unchangeable for him. 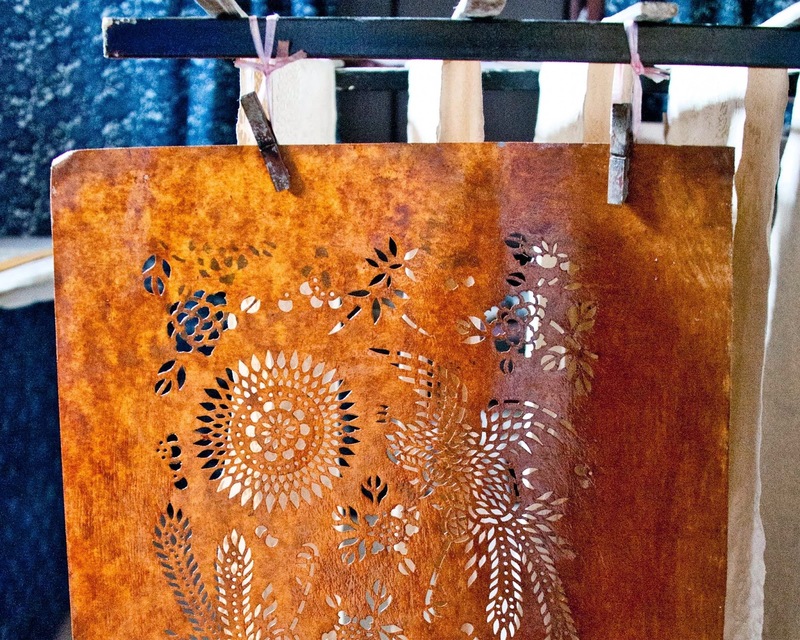 A design is hand-drawn on heavy paper, then cut out using a tiny blade. The paper stencils are relatively fragile, so those that will be repeatedly used are heavily oiled to give them longevity. 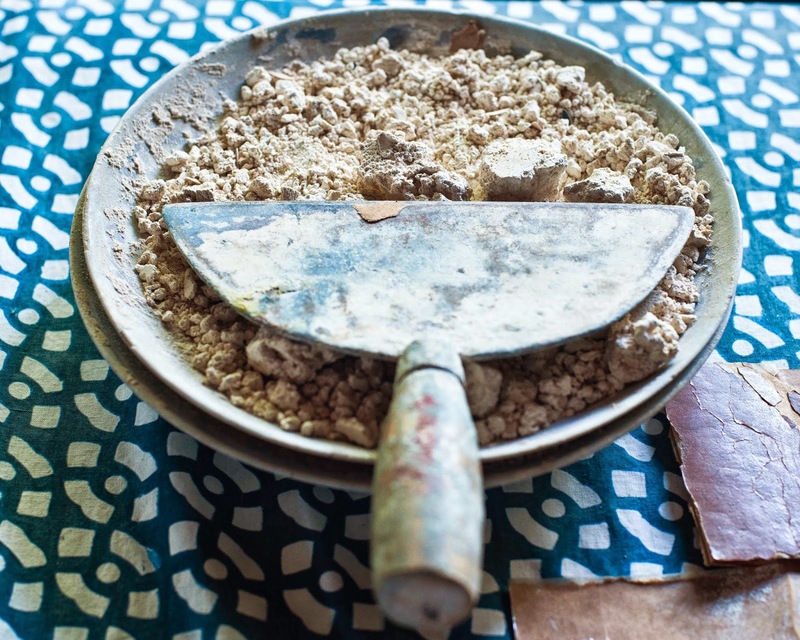 The printing paste is mixed from ground dried soy beans and lime to make a thick, plaster-like paste. 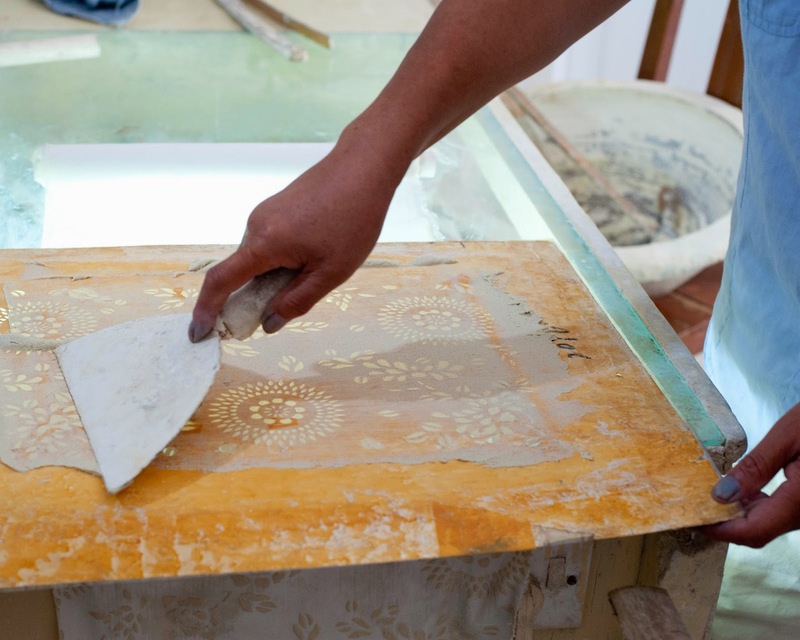 The stencil is laid across a width of unbleached cotton, and the soy-lime paste applied using a broad spatula. 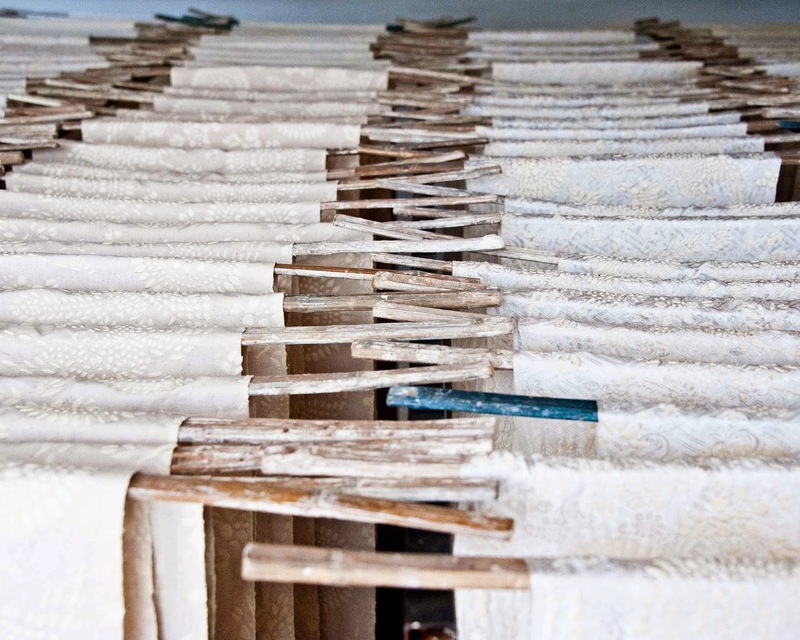 The paste dries over several days into a hard finish in the drying room, hung with hundreds of yards of cloth. Now the dye master takes a length of fabric into the dye room, where there are two deep vats of indigo dye made from fermented indigo leaves. He plunges the fabric over and over into the indigo. Because it's a naturally fermented dye the indigo froths and bubbles and has a curiously earthy smell. The cloth is removed from the dye length by length using bamboo battens and left to drip dry. 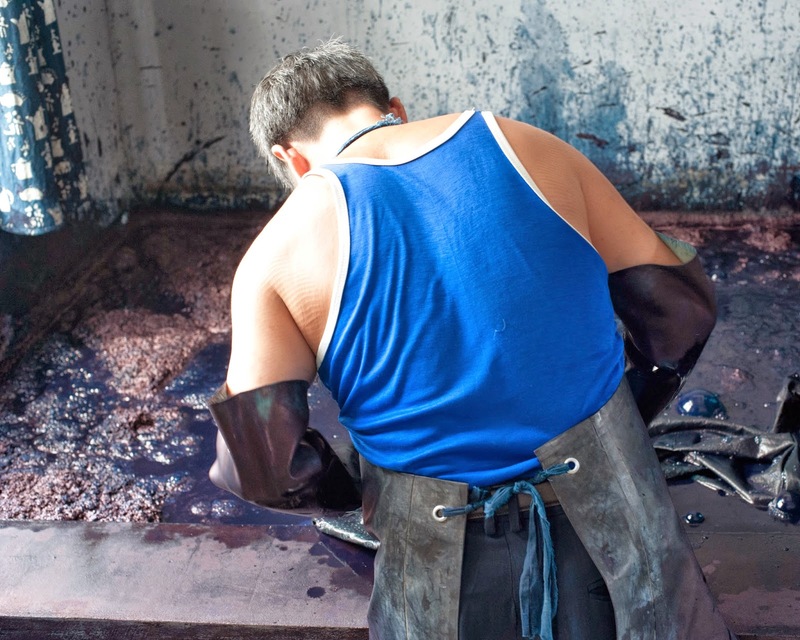 As it dries the initial green-blue hue transforms into a deep purple black, like deepest aubergine. 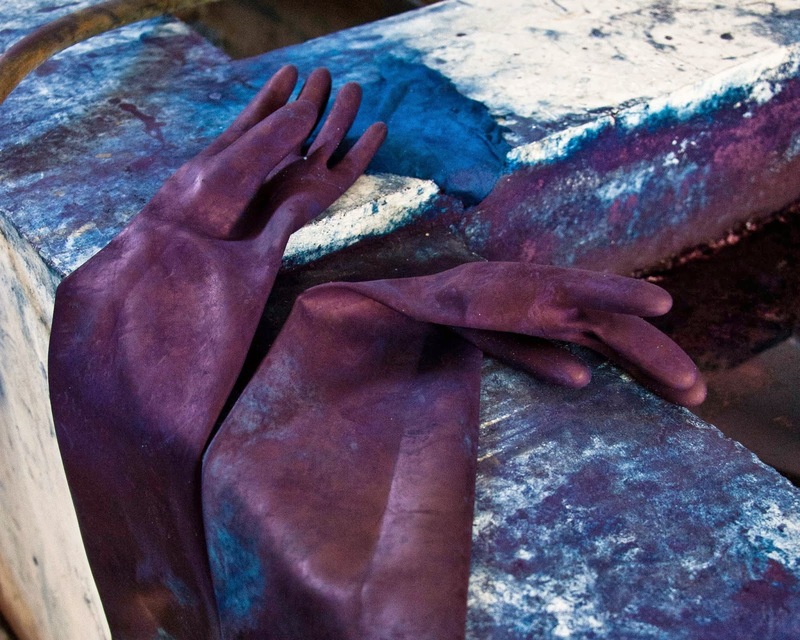 The dyeing process is repeated several times to achieve the correct depth of colour, and the fabric dried. In the final step Master Wu takes a 60-foot length of fabric and stretches it tightly between bamboo poles. He scrapes off the hardened soy-lime paste with a cleaver's edge, to reveal the white resist design beneath. Because the soy-lime paste is poisonous to pests, the fabric was often stored un-scraped until it was required, in order to preserve it. 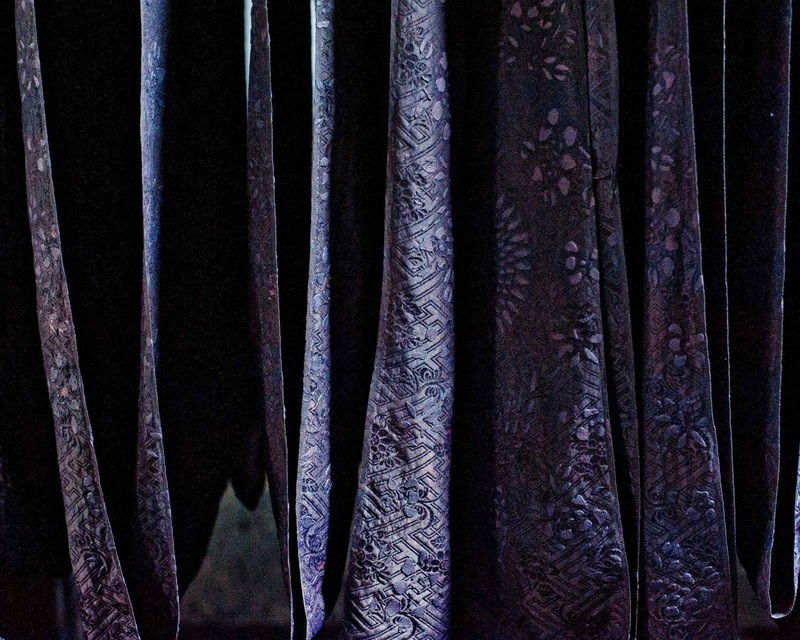 Faint bleeding of indigo dye around the edges of the design is typical of handmade nankeen and not apparent with machine-printed fabrics. If you'd like to learn more about blue nankeen you could visit one of these two small museums, both with attached shops. Blue nankeen is often available in souvenir shops in Shanghai but take care - most of this nankeen is machine-printed using commercial dyes. 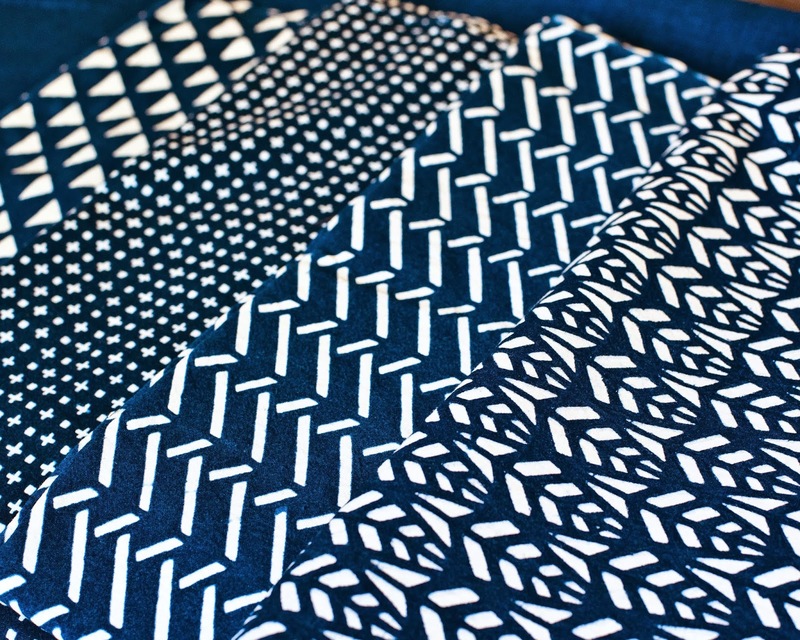 Traditional nankeen has a stiffness and a slightly rough finish, as well as a typical indigo smell. Expect to pay about 60-90RMB ($11-$16) per metre for fabric - anything cheaper than this is unlikely to be handmade. They no longer make blue nankeen at the museum, which is now a large bright shop with museum exhibits upstairs, but they still hang out the lengths of indigo in the garden every day because it looks so wonderful.